When Ari and I originally sat down to discuss our adventures into baking with tea (and our tea party menu), petit fours were the first item on the list. 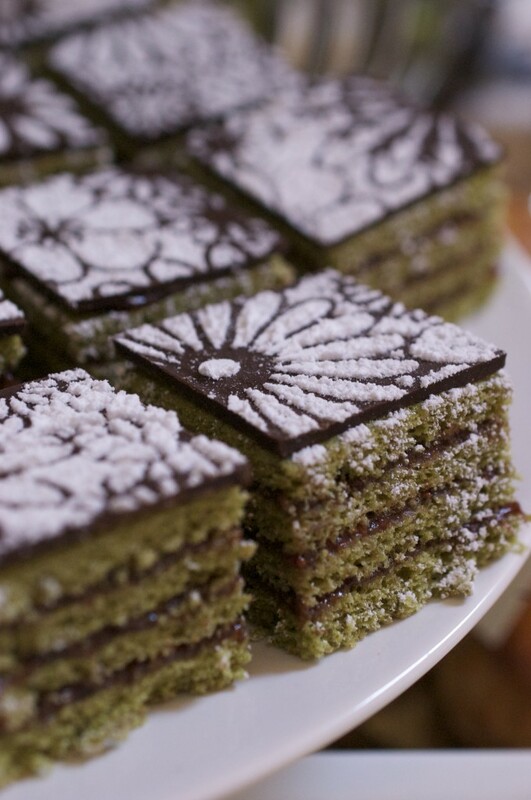 We started by compiling a list of flavor combinations, finally settling on a Match Green Tea Genoise. This cake is a drier sponge cake that is usually meant to be slathered or brushed with a simple syrup which usually contains alcohol. We used a similar recipe in my Birthday Cake post. We knew we didn’t want to use alcohol in these petit fours, so we thought “what goes better with a tea party than some homemade preserves or jam?” We settled on making a Strawberry Balsamic Black Peppercorn Preserve to layer with the cake. The pairing was to die for! 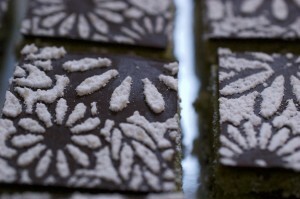 We originally started to make these petit fours the traditional way, by encasing them in a poured fondant. This turned out to be our Achilles heal (well, at least with this recipe). It is definitely on our list of techniques to conquer, but we decided we needed to dedicate more time to this understated art of pouring fondant than our tea party time-line allowed. Despite the lack of fondant, these little cakes turned out beautiful! The bright green genoise, layered with the rich red strawberry preserve, made a stunning display. We topped them with a layer of bittersweet chocolate and then dusted it with a confectioners sugar flower lace pattern. 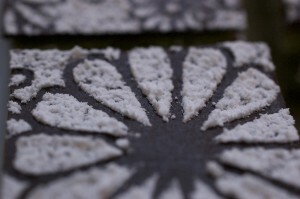 The lace pattern was achieved by using a stencil laid over top of the petit fours before dusting with the powdered sugar, but you could use a piece of lace to get a similar effect. They turned out more beautiful than we both had imagined. The subtle hit of tangy balsamic and a pinch of heat from the black pepper elevate this cake to other-worldliness. Pair this little gem with a nice green tea and daydream your worries away! A dry sponge cake, great for layering with a jam or preserve or brushing with a liquor spiked simple syrup! This is baked in a sheet pan to make thin layers to minimize cutting. Preheat oven to 425°F and prepare a sheet pan with parchment paper. Combine the 2 whole eggs with the confectioner sugar and almond flour with a beater until the batter has lightened considerably (will be a pale yellow color). 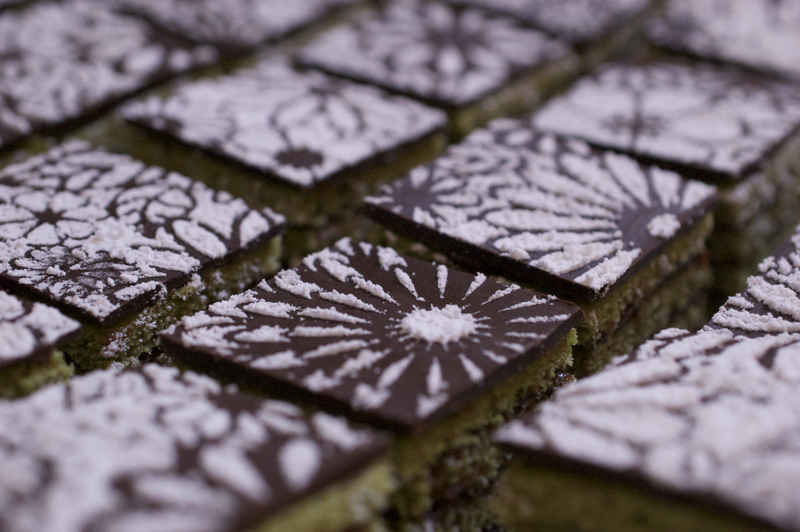 Add the matcha green tea powder and mix on low speed until combined, set aside. In a separate bowl, whip the egg whites on low speed until they start to froth. Add the cream of tartar and increase the beater speed, whipping until stiff peaks form. Add the granulated sugar and whip for a few second longer to incorporate the sugar. Sift flour over the pale yellow mixture, then scoop about ⅓ of the egg whites on top of the flour. Fold in gently with a rubber spatula, until almost combined then add the remaining egg whites and fold until uniformly mixed. Pour batter into a sheet pan and distribute it evenly with an offset spatula, making the layer as level and smooth as possible (the batter will be spread very thin). Bake at 425°F for 5-8 minutes, until the cake is just firm, careful not to over bake as the cake will burn quickly. Remove from the pan and place on a cooling rack. Once cool cut into four even pieces and place in refrigerator for easier cutting and stacking. Remove from fridge and cut, fill, layer and cover as you desire. It is easier to fill the layers of this cake in the largest possible pieces and then cut them down to the shape and size petit fours you want. It produces the cleanest end result, plus trimming off rough edges leaves little bits for "taste testing". these look and sound yummy 🙂 i’m so jealous of people who can bake like this! !